A seven day excursion (6 nights) departing from CEBREIRO at 6 p.m. lying on the border between the provinces of Lugo and Leon - a medieval town surrounded by spectacular mountain landscape where you can still see the primitive dwellings known as "pallozas" and which resemble those built by Celtic settlers. The meeting point will be at Santiago´s airport. We will travel through an un-spoilt countryside of hills, rivers, mountain ranges and valleys with lush vegetation and visit sanctuaries, fortresses, manor houses and see a wide range of Romanic architecture to arrive in the evening of the sixth day in SANTIAGO DE COMPOSTELA where we will visit the city and the cathedral. Board and lodging in First Class Hotel. The itineraries include accommodation and full board, plus professional guides, escorts and insurance, fully-kitted horses and cross-country vehicles. This way was the oldest and most important cultural route of Europe. All the spiritual and cultural grounds are alive today so one thousand years after this pilgrimage way is still in use. We shall ride along the final section of this route just starting at the point where this route reaches Galicia. As a horse-riding pilgrims we shall revive a part of the history of the old Europe. We shall cross along some of the best conservated natural environments of Southern Europe. Remote old villages and historic remains will be reached by us and we shall enjoy nature and wildlife as the ancients did. Meeting at Valiña´s guest country house (O Cebreiro, LUGO). Visit to O Cebreiro where we`ll visit some interesting Celtic historic remains. Horse trip to Triacastela across deep forest of centenarian walnut trees, oaks and chestnut trees. Country lunch at Triacastela, old village with an interesting Romanesque church. 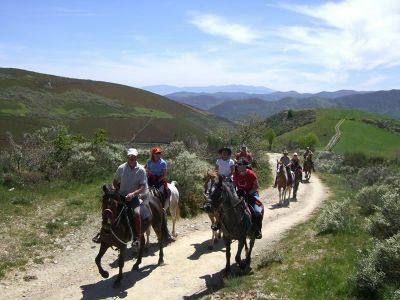 Horse riding to Samos across Oribio valley. We`ll ride across a beautiful natural environment and we`ll visit the pre-Romanesque chapel and monastery of Samos where monks pray and work. Board and lodging at the Hostelry of the Benedictine monastery of Samos. Horse riding to Sarria across prairie and forest. We`ll visit an old convent and a medieval castle. Ride down Miño valley. We`ll enjoy lovely landscape and we`ll visit an old temple at Barbadelo. Country lunch at Mercado da Serra by an old water mill. Horse riding to PortomarÃ­n across the reservoir of Belesar. Board and lodging at PortomarÃ­n Hotel (state-owned). Horse riding across Ulla valley in a pleasant river and country environment. We`ll visit some Romanesque historic remains. Horse riding to Vilar de Donas. There we`ll visit the outstanding Romanesque temple and we`ll enjoy some medieval paintings. This temple was the seat of the military order of Santiago, knights that fought banditry in this pilgrimage route. Horse riding to Melide. We`ll cross an old bridge at Furelos and we`ll visit a medieval castle at Pambre. This is a well-known area for its old water mills. Horse riding to Castañeda. There we`ll visit some medieval lime kilns; many pieces made there were used in the construction of Santiago´s Cathedral. Board and lodging at ArzÃºa. Horse riding to Labacolla. Pilgrims washed one selves there in a brook before visiting the Sacred Sepulcre at Santiago´s Cathedral. We`ll reach Monte do Gozo (it means joy hill) from where a nice view of Santiago de Compostela can be seen. Visit to the Santiago´s Cathedral, the end of a large pilgrimage route. - We provide you with a full equipped horse well adapted to this land. Youcan also bring your own horse (Ask for details!). You don`t need to be an expertrider but some riding experience is preferable. - If you get a minimum of 6 PAX together we can organize a trip any dateunder this condition. If you decide to cancel your reservation no money will be reimbursed, butyou could have the possibility to change the starting date for you trip. SomeTerms and Condition for this tour may differ from our General Terms andConditions, please contact us for full details regarding conditions on thistour.